This process starts with how you, as our customer, ships the machine to us for repair, service or trade-in. The following images will show you some of the questionable packaging techniques used by our customers. We will also give you tips as to what to do to ensure your valuable machine arrives in our warehouse safely. 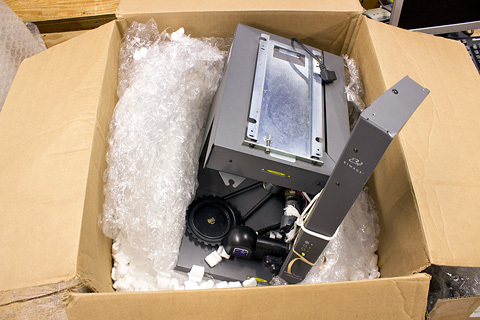 Here is a picture of a bad packing job on a PrismPlus Autoloader that was recently sent into us for repair. Notice how the robotic arm is twisted and dented. This is from lack of support due to poor and inadequate packing materials. Avoid packing peanuts and weak bubble wrap. 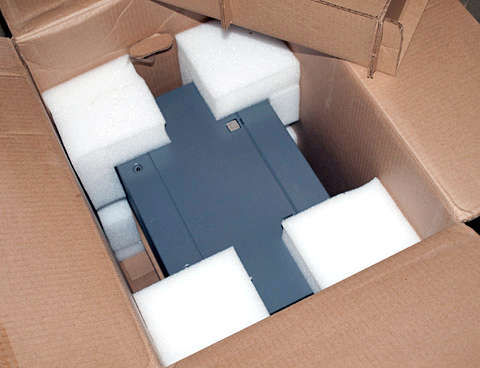 Firm and snug-fitting packing foam is the preferred material for shipping. Strong plastic bubble wrap can also be used. Be sure the box has at least 3" of space around the unit for cushioning. Heavier units (40lbs. or more) should be packed in a double walled box. Below shows a proper way to package a thermal printer with original foam support. These types of printers are very heavy and they require heavy-duty, tight-fitting packaging to survive any drops during shipment. Use the original shipping box and foam. Do not throw the box away. If you do not have the original box, call us at 1-800-295-0083 to buy the correct packaging. If you don�t have time, start with a double walled box that is large enough for the Rimage unit and use firm packing material. Use snug fitting inner packing foam � no peanuts, no shredded newspaper or confetti, no thin bubble wrap, etc. Call toll free (800) 295-0083, ask for Mike Pfannenstein. To get your repair started, visit our repair shop page and fill out the form on the right.